A provocative survey of new research in the history of urban public health, Body and City links the approaches of demographic and medical history with the methodologies of urban history and historical geography. It challenges older methodologies, offering new insights into the significance of cultural history, which has largely been overlooked by previous histories of public health. This book explores important issues and experiences in the public health arena in diverse European settings from the Middle Ages to the early 20th century. 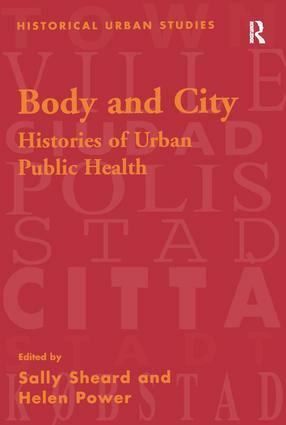 Contents: Body and city: medical and urban histories of public health, Sally Sheard and Helen Power; Ritual and public health in the early medieval city, Peregrine Horden; Languages of plague in early modern France, Colin Jones; Copenhagen 1711: Danish authorities facing the plague, Peter Christensen; Fighting for public health: Dr. Duncan and his adversaries, 1847-63, Paul Laxton; Town hall and Whitehall: sanitary intelligence in Liverpool, 1840-63, Gerry Kearns; Working-class experiences, cholera and public health reform in 19th-century Switzerland, Flurin Condrau and Jakob Tanner; Public health discourses in Birmingham and Gothenburg, 1890 -1920, Marjaana Niemi; Choices for town councillors in nineteenth-century Britain: investment in public health and its impact on mortality, Robert Millward and Frances Bell; Economics and infant mortality decline in German towns, 1889-1912: household behaviour and public intervention, John Brown; The decline of the urban penalty: milk supply and infant welfare centres in Germany, 1890s-1920s, JÃ¶rg Peter VÃ¶gele, Wolfgang Woelk and Silke Fehlemann; Index.